instead, they think in terms of opportunities. "An organization takes on the personality of the leader." 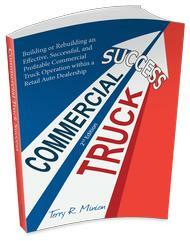 I talk to dealers and managers at auto dealerships about their commercial truck department or the potential of a commercial truck department. Many times I'm talking to the person who wants the department to exist and succeed, but hasn't the power to just take charge of the resources within the dealership to get the job done well and in a timely manner. In fact, often, they complain about the dealer not giving the support, theoretical and real, to the task they have in their mind. I've written a book on this whole subject so I've thought this through pretty well. As I reflect on two separate very successful commercial truck departments that I have started, along with others whom I've taught to do the same, one thing is common. None of the dealers or general managers gave the support needed in the early stages. In fact, they had to be convinced of the viability of it almost on a daily basis so they wouldn't throw in the towel. The other thing that is common is that the success of this kind of endeavor without the unanimous, enthusiastic and liberal support of the dealer and/or general manager, requires a person who is a leader. I cannot see it happening without this aspect and quality. Yet, so many that I have talked with are afraid and/or unwilling to lead. I do believe that the best and brightest example of a successful commercial truck department would be one in which the leadership toward that success came from the top down; however, since this is rare, the one who has the desire must become the leader within the organization. John C Maxwell's wonderful book, The 360 Degree Leader is all about accepting the challenge of leading from whatever level you find yourself in an organization, and he has numerous examples of how that acceptance and execution has created otherwise unknown success. This requires courage, tenacity and vision. And, it requires accepting responsibility for the creation and execution of getting the job done and doing it well. They cannot live in the fear of losing their job. They are and must be risk takers. There are leaders within organizations that accept these terms and thereby change the world--or at least, their part of it. Let me leave with two more quotes from John C Maxwell: "The role of leaders in the middle of an organization in nearly every circumstance is to add value to the organization and to the leader." And this important addition: "Your job isn't to fix the leader; it's to add value. If the leader won't change, then change your attitude, or your work address." Become The Leader That You Know You Can Be. It Is A Life Well-Lived. Spread Some Joy Today--Realize you have the power. That will bring joy.